The campaign will start from 1st May 2008 and carry on for two months till 27th June 2008. The whole of the Indian coast will witness mass mobilizations with agitations, demonstrations, rallies, reception, public meetings, seminars and press conferences all along its stretch in the months of May and June 2008. On 1st of May, the international day of labour, the campaign will commence at Jakho in the Run of Kutch in Gujarat and will end in Kolkata in West Bengal on 27th June 2008. A central campaign team comprising of eminent leaders of National Fishworkers’ Forum (NFF), National Coastal Protection Campaign (NCPC), peoples movements and civil society organizations will spearhead the campaign. Andhra Pradesh: Ongole- 11th June. Meeting the community and halt. Dhakti Dahanu-Gungwada (lunch) Wadhavan-Varore-Chinchani-Tarapore-Ghivali- Ucheli. Murbe-Alewadi-Navapur- via- Boisar – Palghar. 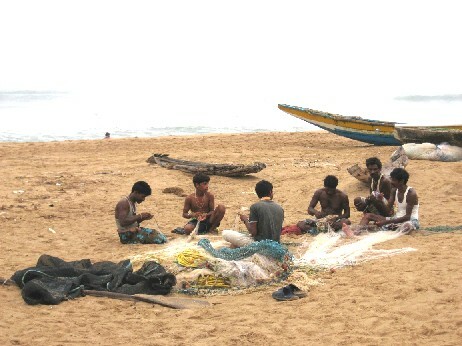 Satpati (Shri Rajendra Meher and Shri Vinode Patil, Chairmen Satpati Machhimar and Satpati Fishermen Society)-Vadarai – Mahim (Tembhi) – Kelva – Datiwara –via- Kore – Edwan – via- Safala. Arnal - via - Virar and halt (Arnala Fishermen Society, Shri Vaity, Shri Dhaki, Shri Koli, Shri Patil & other colleagues. Arnala (Four Machhimar Co-op.Societies) – From Nala to Bassi(Pachubandar) – Shri Philip Mastan – Khochiwada- Naigaon-via- Bassain Road. Gorai (participation in NAPM State Convention) – Manori – Malvani –via- Marve (by boat). Madh-Bhati ( Shri Kiran Koli and collegues). Mahim-Sulup - Machhimar Colony – Mahim Mahikavati Society, Mahim Machimar Co-op Society & Nakhoa Co-op. Sangh, Mahim. Dinner (Shri Dinkar Tandel,Sri Dilip Pagdhare and other collegues. Halt. Worli Koliwada – GosfaDevi Sea face via Munbai Central. Bhaucha Dhakka (Kasara port) Shri Karsan Bhai and Shri Dilip Pagdhare, Shri Keluskar , Shri Vasant Mahulkar & other collegues. Cuffe Parade( Colaba) – Shri Moreswar Patil, Shri Ramesh Meher, Shri Raghunath Bohir, Shri Laxman Dhanur & others. Machhimar Sarvodaya Sahakari Society, Cuffe Parade – Lunch. Shivaji Mandir (Dadar) via Trombay – Mahul. Karanja (via Vashi – Uran). Night halt. Dinner: Shri Ravi Koli, Karanja. There will be Seminar on ILO Convention on Work in Fishing Sector at Rajashri Shahu Sabhagrah, Shivaji Mandir, 3rd floor, Dadar, Mumbai. – Maharstra Machimar Kriti Samiti. Karanja- Bodani by boat (Vehicles at Rawas via Karanja- Vadkhal in the morning) Shri Datta Hashya Nakhwa, Shri Koli & others. Alibag (Lunch) Shri Ullash Varkate,Shri Ravikant Parekar & others: Alibag Machhimar Society. Akshi – Revdanda – Bheronda – Korlai- Bolai- Borli- Mandava – Ekdara- Murud. Murud: Night Halt and Dinner. Dighi – Bharat khol – Masala via Shrivardhan (Jivana Bandar) – Lunch. Baghmabdle via Bankot. Harnepaj (Harnepaj – Ade – Utambar-Burandi- Public Meeting, night halt: Shri Pawesha, Chairman Harnepaj Machhimar Sanstha,Shri Chaugule, Shri Narayan Raghuvira and other colleagues. Harne- Dapoli- Dabhol Khadi (Jangal Jetty) via Ajanvel – Navanghar- Veldhur-Dhopave- Nari Bandar –Lunch: Shri Datta Vankar and others. Asgoli via Guhaghar – Palshet-Konkarul-Velneswar –Ade Agar – Hedavi via Katala-via Navanghar Khadi (Jangal Jetty) Chinch Bandar- Varvoda. Ganapatipule – dinner & night halt. Mirak khada (Ratnagiri): Lunch: Mirak Khada Adarsha Machhimar Co-op. Society. Purnagad via Pawas. Deogarh : Lunch – Deogarh Machimar Society & leaders. Malwan : Public meeting - Nathpai Sevangan : Malwan Taluka Sramik Machhimar Sangha and Machhimar Sahakari Society. Night halt & Dinner: Guruji Shri Jnanesh Deulkarji and other collegues. To Panjim via Malwan- Goa Road. May 25 – From Kasargod Kasbah to Kannoor Town. May 26–From Kannoor Thalassery to Ninanvalappu in Kozhikkode. 22nd : The Campaign Team reaches Jharkhali in Sundarban in the afternoon via Kolkata after entering W.B. and attends a fishworkers' meeting. Stay at Jharkhali. 23rd : The Campaign Team attends fishers' agitation at Canning in Sundarban before the Tiger Project Office. Stay at Kolkata. 24th : The Campaign Team attends a Fishworkers' meeting at Kakdwip in South-24 Paraganas at noon. Moves to East Medinipur and stays at Junput. 25th : The Campaign Team attends several village meetings along the East Madinipur coast. Stay at Dadanpatrobar. 26th : The Campaign Team attends a central meeting of fishworkers at Kanthi (Contai) in the afternoon and stays at Kanthi (Contai). 27th : The Campaign Team comes to Kolkata. Press Conference at Kolkata Press Club at 3.00pm, Citizens' Meeting at Studets' Hall at 5.00pm. Stay at Seva Kendra. A Review and Planning Meeting will take place at Seva Kendra, Kolkata on 28th from 9am.